Welcome to Memoirs of a Pinup Girl. 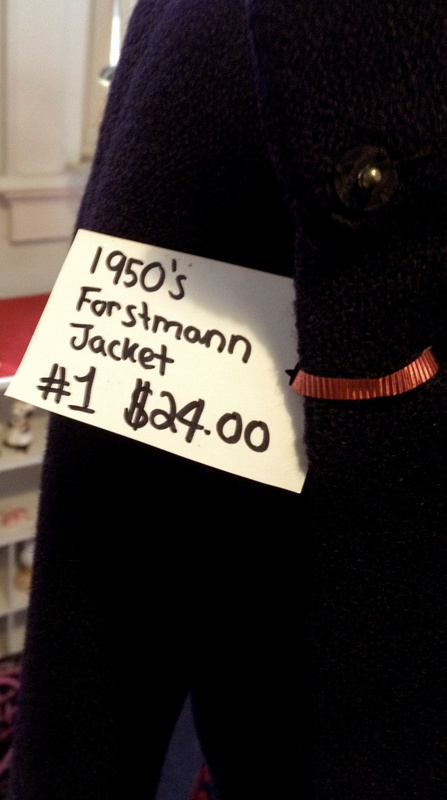 Morgen Stiegler's space for exploring all things vintage and specifically, the 1940s and 50s. In a bi-monthly blog/vlog format, I will team up with experts or just roll up my own sleeves and bring you all sorts of retro treasures. Memoirs of a Pinup Girl 3_14_14: Is That Your Grandma's Coat? Ok. Listen, vintage lovers. Let’s have a heart-to-heart. If you’re into vintage shopping, there’s a good chance that you’ve frequented second hand joints, antique stores, and even your parents’ and grandparents’ closets. This girl is proudly (and loudly) guilty. Chances are also good that you’ve made some great (and a few not so great) choices. It comes with the territory, right? Having a love for items with a unique past is both a blessing and a curse sometimes. Green plaid button up dress, ca. 1970s. Modern cardigan. I, too, have been tempted to impulse buy that not-so-flattering handmade 70s circus-like dress because it was vintage and “Hey, it was 99 cents!” Okay- that may have actually happened. But there’s a good reason I love Macklemore’s Thrift Shop song. It rings true in my soul. There’s nothing more beautiful for the vintage-obsessed than making that perfect find. Achieving a retro nirvana, if you will. Many of us have seen vintage done really (and I mean really) well. And I’m pretty sure we’ve all seen plenty of vintage tragedies – say, maybe a Cosby show sweater and a Golden Girls pants suit decided to get together and pick up Little House on the Prairie boots on the way? Yep, you know what I’m talking about kids. So how do we not let our impulses and our love of all things vintage get in the way of a great look? For this blog, I teamed up with a few ladies, pushed back my sleeves, and dug in. Disclaimer: I did not exit this research project without buying a few said fabulous finds. However, I’m proud to say R. Kelly’s sheets did not even make it on my radar (Thanks for that, Macklemore). If you know me, you are well aware that I love a good adventure. Specifically, if it involves anything vintage – I’m there. While at a show, I stumbled upon some word-of-mouth information about a beautiful vintage clothing collection in Toledo, OH, so I decided I should check it out. My girl Chelsea and I fueled up with coffee and went to a little out of the way place, and I was glad I did. First, because the clothing was exquisite. Second, because the owner of the clothing was actually packing it up to move it out as we got there. (No worries- she will be opening a store front by May, and I WILL be telling the world). I was so happy with that collection that it may have prompted a series of embarrassing snapchats by the wing girl. As I dug deeper, I started to formulate ideas and tips… and scored some serious threads. Retro Nirvana? Status: Achieved. Our goal was to build three looks. It took us a few hours, and some interesting mannequin maneuvers, but our results are posted in the gallery. 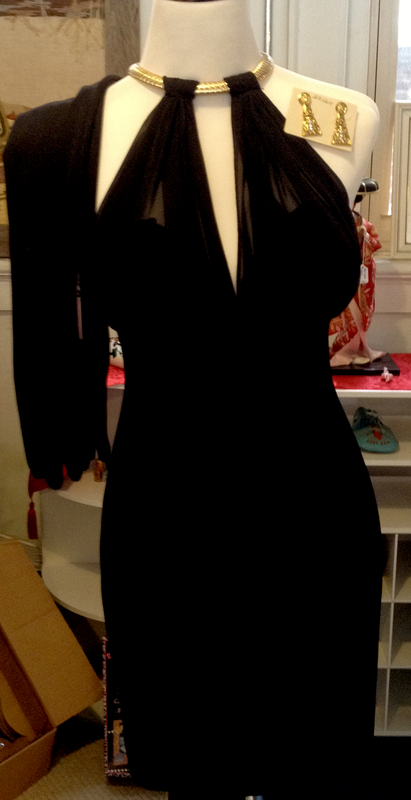 Outfit 2: Vintage Tadashi Gown, ca. 1950s. 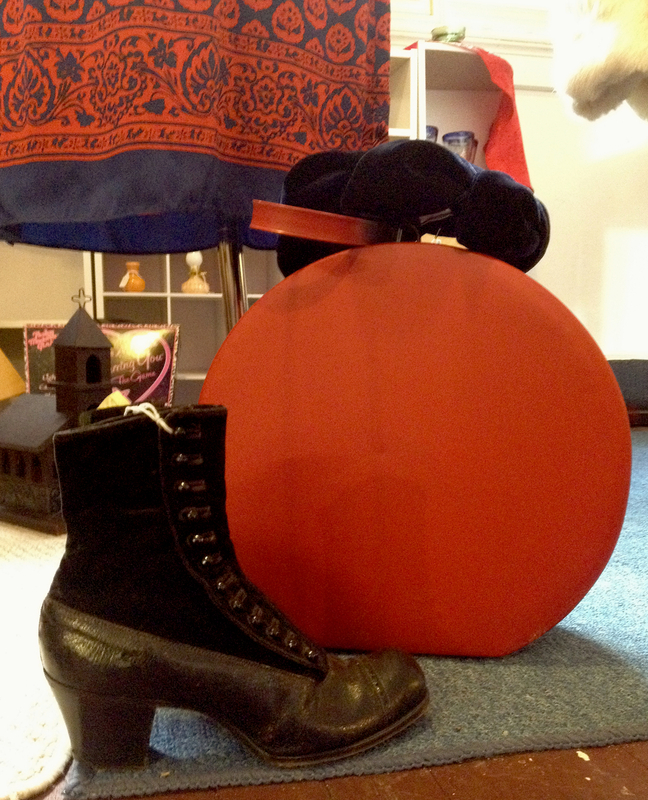 Outfit 3: Vintage Betsey Johnson Red/Navy Dress, 1950s Forstmann Jacket, Edwardian boots, 1960s red hand case, 1950s pillbox hat. *Click on picture to access gallery. 1. Go in with general ideas or inspirations, but don’t be afraid to venture outside of your comfort zone. There are camps of (admirable) folk out there that ONLY wear vintage from the same time period. All the time. These people are my heroes, but personally I love an eclectic look. I’m not afraid to buy reproduction attire when I can’t find what I’m looking for, and I think it’s fun to mix modern and vintage. 2. Try EVERYTHING on, and only buy it if it fits well or you can alter it to fit well. This is key. A well-fitting piece can make you feel like Jackie O, while an ill-fitting piece… well, let’s think back to that Macklemore song. 3. Find a seamstress/tailor that is well-equipped to respectfully alter your new piece if need-be. I find plenty of pieces that I love for one reason or another, but they often need to be customized to fit my particular body. As the owner of the collection shared with me, the human body has changed A LOT since the early 1900s. So much, in fact, that she rarely buys pieces that predate the 1950s, when our physiques started to fill out. 4. Accessorize! Don’t buy a piece and be done.. Look at it as a personal story waiting to be retold. Pair vintage or modern accessories with it. Then, look for new ways to mix it up. 5. Have a good look-over at the piece for moth holes, loose threads, broken zippers/hooks… and only wear it once you’ve fixed these items. Nothing is more painful than to pay for a beautiful piece, only to rip it up the back. Trust me, I know all too well. 6. Take a friend that will be honest with you. For instance, I know that if I ventured so much as an arm or leg into anything "Cosby Show" or "Golden Girls," I’ve got at least two friends that would tell me I’m not making good life choices. Keep these friends at your side and then reward them handsomely with Starbucks. 8. When you aren’t having luck with vintage, form a great relationship with a reproduction designer or store owner. Gina Moscrop at Bear Flag Republic USA deals in both reproduction and vintage, and she’s always got my back. She stands behind her product and is even willing to serve as a style consultant. So more generally, what are some good general tips for shopping excursions themselves? You can find places to shop by googling a bit, but I’ve found word-of-mouth places and vintage aficionados like the aforementioned are often the best. It never hurts to join some online groups. And although it’s hit or miss, I love to frequent estate sales. I’ve found some sublime vintage treasures there. Consignment stores can also be a great way to unload the choices that weren’t so great for you, and pick up a new look. Allison Nelson, style consultant, consignment shop diva, vintage fashion blog queen, and all around adorable girl. She’s that girl that makes consignment fashion look effortless, and she has a blog. Be ready for a work out. Vintage shopping is the most amazing treasure hunt out there, but you have to be willing to work for it. The right pieces very rarely fall into your lap, so be prepared to try on, sift through, and stalk these items. Eat a good breakfast beforehand, dress in basics for layering, and bring coffee because vintage shopping does not take breaks. Just because at first glance a garment may not grab you, give it another chance. We all love the flashy pieces, but sometimes a gem is hiding between these. A garment can be completely different on the hanger than on you! More of a technical tip, but some mom and pop stores may only take cash; don’t get left in the dust. Vintage fit is very different from modern day sizing. A size 6 today can easily wear a 10/12 in vintage clothing. Try on Try on Try on. I love shift dresses, but they do not feel the same way about me. Know what fits you best, and do not be afraid of different shapes and styles. The more I research and learn about different eras’ trends, the more I appreciate the vintage treasures before me. A pretty dress is a pretty dress…but when you know some of its history you are bound to love it and take care of it much more respectably. You are digging through history here! Have a blast reminiscing who might have worn that blouse before you and the stories it could tell. Talk up the owners of the shops, they are bound to have some favorite pieces as well as tales about special items. Whew! After so much research and a little of my own field work, I'm ready to put this blog in the bag. This topic deserves pages of attention, but I've shared a few nuggets of perspective that I took away from my recent blog inspired adventures. Long story short, don’t be afraid to be original, but make informed choices. Live loudly, think soundly… When it comes to vintage, tell a cohesive story that jives with your own persona. Don’t try to be the next Judy Garland, be the next “you”.. Find a unique and genuine look via the vintage medium. There are plenty of wanna-be’s but you are the one who’s best at being you.